Providing access to texts; Helping readers understand scholarship; Enabling new scholarship; New scholarship, the digital library and the institutional repository. One of the major challenges facing librarians and curators of digital repositories are the innovative ‘born digital’ documents created by scholars in the humanities. These documents range from the parsed corpora created by linguists to traditional reference information presented in electronic databases, to rich, multi-media hypertexts combining audio, still and moving video and text, and many other sorts of material. Too often, librarians think of electronic resources solely as providing access to subscription databases. 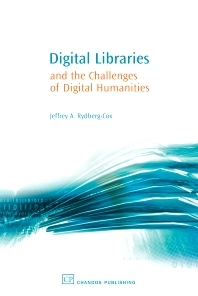 This book encourages librarians to think holistically of the life cycle of electronic resources from new items being created at their institution, to end-user access, to long term preservation of digital resources. Dr Jeffrey A Rydberg-Cox is Director of the Classical Studies Program and an Assistant Professor of English, Religious Studies, and Computer Science at the University of Missouri Kansas City. After completing his Ph.D. at the University of Chicago in 1998, he worked for two years as a programmer and computational lexicographer with the Perseus Digital Library at Tufts University before taking up his current position in 2000.